Every summer, my husband, boys, and I visit our family in the USA for several weeks. This past summer, we got into watching America's Got Talent and continued to watch it from China when we got back in August. One of our favorite acts was Sam Comroe, a hilarious comedian with Tourette's Syndrome. Although Sam didn't win AGT, he did make it all the way to the finals. We loved Sam because he really was funny, but like many viewers, we also admired his courage to embrace his Tourette's and include it in his comedy act. Sam brings a new face to Tourette's Syndrome, and I think he helped viewers better-understand the condition. 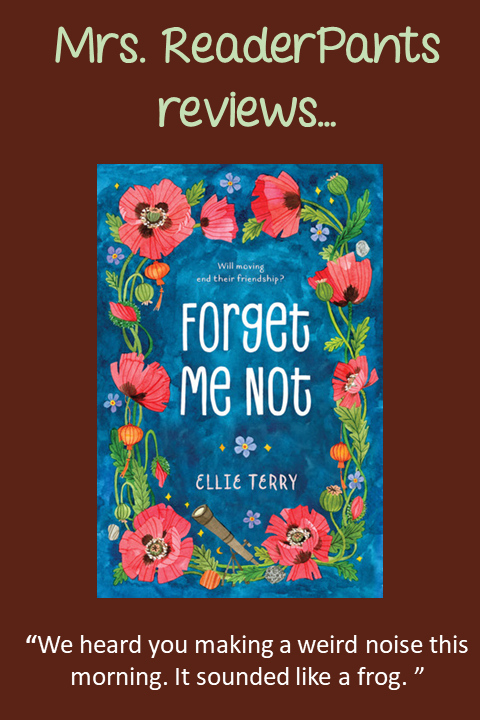 Like Sam Comroe, Ellie Terry helps shed light on Tourette's with her semi-autobiographical Forget Me Not. Calli June's story is a must for every elementary and middle school library. It's a great story, but more importantly, it brings Tourette's out into the open. Trivia question of the day: I can only think of one other book for young readers that features a character with Tourette's Syndrome. Any guesses? SUMMARY: Seventh grader Calli June is starting her tenth new school. Her mom picks up and moves every time she breaks up with a boyfriend, and Calli's Tourette's Syndrome really doesn't help her make new friends at the new schools. Above all, Calli is tired of moving, and she hopes this school will be her last. REVIEW: A quick, sweet read that absolutely accomplishes the author's stated purpose of bringing awareness to Tourette's Syndrome, which the author also experiences. Calli June is a sympathetic, real main character, and I found myself wanting to reach in and strangle her flighty mother. Why some women just can't seem to function without a man in their lives is just beyond me. Unfortunately, Calli June's mother represents far too many mothers in our students' lives, and I'm sure many readers will recognize themselves in Calli June. The book alternates between Calli June and her classmate and neighbor, a boy named Jinsong. Calli June's chapters are told in free verse, which works brilliantly to spotlight her Tourette's symptoms. Jinsong's chapters are very short--no longer than two pages--and written in prose. The short chapters make this a great choice for reluctant readers. They aren't even chapters, really, just alternating viewpoints. Not one is longer than two pages. I also loved the Author's Note at the end and hope student readers take an extra few minutes to read it. The author describes her own experiences as child with Tourette's, including an encounter with a doctor who, like Calli's doctor, told her to keep her Tourette's diagnosis a secret from people in her life. She also discusses common Tourette's Syndrome's co-conditions like trichotillomania (pulling out one's own hair), obsessive-compulsive disorder, and anxiety. The only thing I didn't like is that Jinsong seems a bit "golden" as a character. He's a 12-year old boy who likes Calli immediately, but he doesn't stand up for her when his friends make fun of her tics and strange clothing. After a bit, Jinsong does stand up for Calli, and it costs him greatly. I'm glad he stood up for her, but I work with 12-year old boys every single day. For 13 of my 18 years in education. And I have two middle school boys of my own. All that considered, I really don't see any popular seventh grade boy publicly standing up for an outcast and screaming from the top of a Ferris wheel that they "like" said outcast. It's nice that he did it, but unfortunately, it's not very realistic. THE BOTTOM LINE: A must for elementary and middle school libraries. I will be booktalking this one often. STATUS IN MY LIBRARY: We have it. I was the first to check it out since we got it earlier this school year. Now that I've read it, I will make sure it circulates well. So what's the only other book I can think of with a character with Tourette's Syndrome? It's the Michael Vey series by Richard Paul Evans. We have this book in our Elementary library and it is always circulating! The kids love it. They always ask if she has written other books. Thank you so much for writing about this book! My son has TS (Tourette Syndrome) and we all appreciate the empathy and awareness that has come from people reading this book. We also love comedian Sam Comroe and the humor he has brought to this TS life! Thank you, thank you, thank you! Thank you for sharing your son's story. I am so happy publishers and authors are slowly putting out more "own voices" books. Very much needed!